With Deadpool 2 finally arriving in theaters last week, fans who stayed through the end of the credits did not find an extra post-credit scene (though there is an incredibly memorable mid-credits scene), but there was a dedication to a fallen crew member. Towards the very end of the credits, a dedication was revealed, reading, "In memory of Sequana Harris," otherwise known as S.J. Harris, the stuntwoman who died during a tragic on-set accident last year. Sequana Harris was the first African-American female professional motorcycle racer, who was performing a stunt as Zazie Beetz's character Domino when the accident occurred. Sequana Harris died on the Vancouver set of Deadpool 2 on August 14, with production shut down briefly in the aftermath of this accident. Witnesses stated that Harris lost control of the motorcycle she was riding and crashed into a plate glass window at the Shaw Tower in Vancouver. She had been reportedly rehearsing the stunt for two full days, and they also ran the scene five times on the day of the accident, including the scene that was filmed. Harris was not wearing a helmet when the crash occurred, because her character Domino doesn't wear a helmet. That report from the fatal crash also claimed that the cast and crew were "exhausted" at that point in the production, with the shoots typically going over the standard 12-hour days, with some days going as long as 15 hours while one unidentified crew member claimed they worked multiple 16-hour days in a row. There were reports that production was shutting down "indefinitely," but on August 16, just two days after the fatal accident, production was up and running again. Another report surfaced just a few days after production resumed, revealing that Harris was supposed to drive through the open doors of a building and down a ramp that went over a small set of stairs, and she was supposed to stop at the bottom of the stairs. After five successful rehearsal takes, she filmed the scene for real, but Harris continued past the planned stopping point, down a second ramp, and down a bottom set of stairs, and acrss the roadway, where she hit a curb and was set flying through the Shaw Tower plate glass window. While Harris was a professional road racer with years of experience, it was her first movie job as a stunt rider. The death was described as a "freak accident," and while Harris did miss her mark, she was still travelling at low speeds, with the investigation concluding that she never took the bike faster than 9.3 miles per hour. Following her death, stars Ryan Reynolds, Josh Brolin, Zazie Beetz and director David Leitch offered heartfelt statements, sending condolences to Harris' friends and family. Harris became the first ever African-American professional road racer when she joined the American Sportbike Racing Association/Championship Cup Series in 2014, with Harris having logged over 1,500 hours of riding. 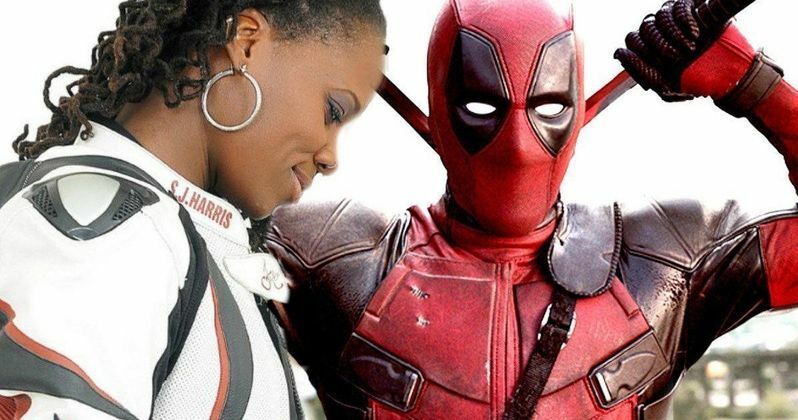 The Hollywood Reporter broke the news about Deadpool 2's tribute to Sequana Harris.